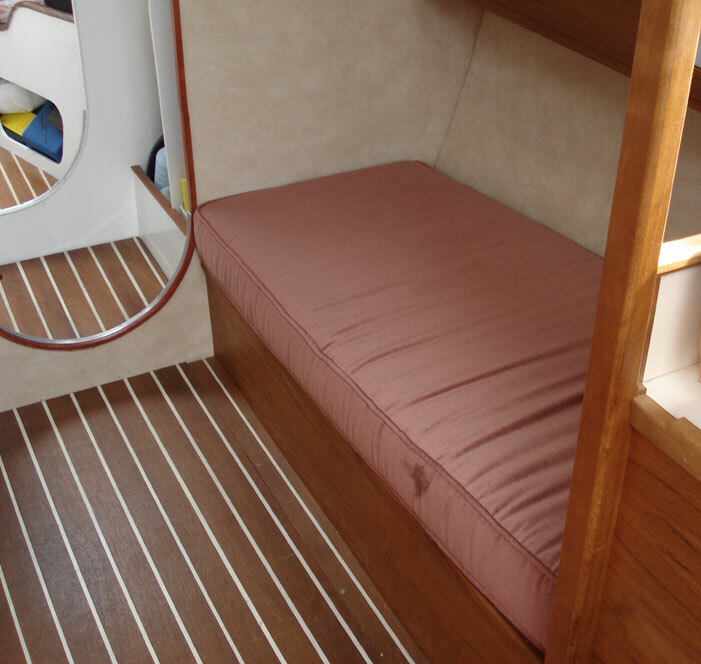 To buy the teak and holly inlaid marine ply for a Trident cabin sole would cost over £300 as it requires more than one 8’x4′ sheet. This is my cheat – costing 50p in masking tape plus a small amount of white emulsion paint to create the stripes. Once covered with tough floor varnish the white paint turns beige but shows the grain through and if you don’t look too closely it does the job. The finished floor pictured has put up with 5 year’s wear. 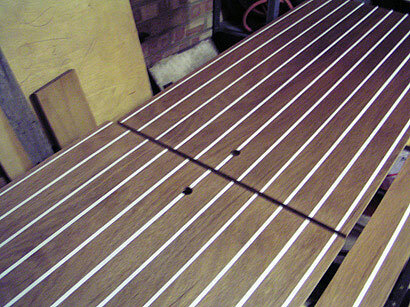 The boards in the saloon were cut to provide a removable central section providing access to the bilges, and two border strips which are screwed down. This prevents the floor boards scraping the veneered bunk fronts when lifted and allows the grab posts to be fitted right to the floor without getting in the way of the lifting section. The flooring in the saloon was also split into two sections. Each gives you something to stand on while lifting the other.